road tripping it back to Fayetteville where he still goes to school/where I went to school. we will be celebrating my birthday on Sunday... 23, yikes! Hope you all are having a wonderful week. those are from f21 I need to get some! love the jumper with that skirt and those shoes are gorgeous !! Love the tonal outfit! 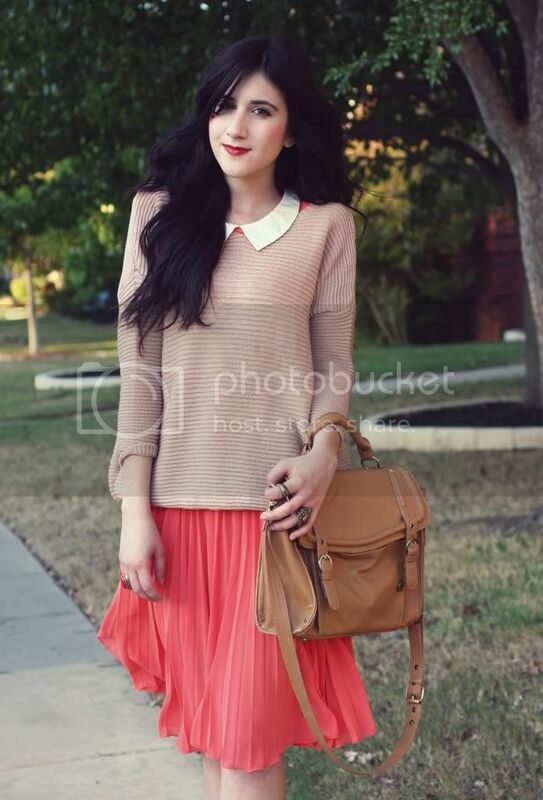 I love the peeking collar, lovely rose sweater and coral pleated skirt! :) Oh, and your sunnies are adorable. i'm so in love with this look, you are so amazing and I would have never thought to pair all of this together. you glasses are adorable too! This looks so pretty together!! I love the tonal looks I've been seeing lately. You did an awesome job. Have a great birthday too!! thanks for visiting!!!!! loving that top girl!!!! Adore the various shades of red on you. And those mary janes are darling! Have a fantastic birthday and great time going back to Fayetteville with the boy! 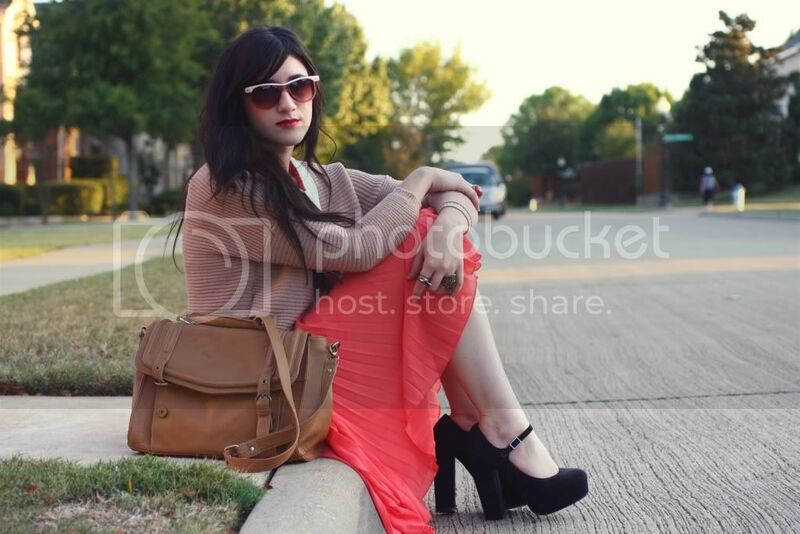 So cute, love the skirt, and my heart pumps everytime I see those chunky heeled mary janes! Hope you have a wonderful bday! You'll joi me to the 23 club! the colors in this outfit are sooo perfect. loving the shoes, too, bonnie! This is really pretty Bonnie! I love the lighting and your make-up. So simple but lovely. The skirt looks lovely with the top, not a colour combination that I would expect but it works! Happy early birthday Bonnie! I love this skirt and the great sweater! Enjoy your couple time! I've been reading your blog for a few weeks now, and I don't think I've commented before (shame on me!) but I really love your blog and your style, and I am also quite jealous of your gorgeous hair. I had to break my comment silence to say I love this look. The tonal dressing is such a great way to colorblock without going too crazy, and this outfit is so ladlylike and pretty. Oh honey you look amazing! This is defenitely one of my favorite outfits of you! Really pretty. Lovely outfit and great choice of colors. I love your dress and I'm looking for the pleated skirt in the same color! i love this look, you each day looks so pretty! !1i really love your blog always!!! Great Idea for the outfit! Have similar skirt. Have to think it over. Looks very chic! Oh I really like your shoes!! You look so pretty in these photos! I like your style! Take a look at my blog, and if you like it, we can follow each other, I'll be waiting for you! Gorgeous skirt and shoes. Love the colour. Very nice bag! Love it. love this color combo! and the layering is wonderful! ah youre so pretty bonnie :) if there was ever a perfect oufit i think this is it! pretty colors, check. great collar, check. cutest satchel, check! :) happy early bday! you looks o pretty! love this fall outfit! And your shoes are amazing! Hope you'll spend a great day celebrating your birthday. This looks great on you - the shoes are perfect! I hope you have a great trip and enjoy all the birthday celebrations. Amazing shoes, I loooooove them and I want them !!! so cute, love those shoes! the color of that dress is amazing!! and those shoes are gush worthy as well! you look beautiful! This is such a beautiful and feminine outfit! I love the colors! Hello, happy week kend. I love your look is fantastic. And your skirt love it. these two versions of pink look so lovely together! also really like your sunglasses! I love a sweater over a dress like that. It's such a great way to extend your wardrobe. And those shoes are amazing! Love the pink pleated Chicwish dress! I love everything you are wearing! I just bought a skirt around the same color as yours and I love it! It reminds me of summer. Gorgeous tonal outfit. Love the skirt and sunglasses. The mary janes look great with the rest of the outfit. Hope you'll have an amazing weekend with your boy! nice. i love those shoes!!!! Our birthdays are really close together. Hooray for October people! I love the way you pair colors. These two tones look really nice together and your sweater looks incredibly comfortable. Wow, you look so pretty! Have a nice day hun! Great look! Lovelovelovelove the shoes! I adore the cute outfit, especially the shoes ! Loving the first picture of you. Hope you have a nice week too! I can't decide if I like your shoes or your skirt better. Both are gorgeous! This is such a gorgeous outfit, Bonnie. And happy early birthday! I hope your weekend goes well! Safe travels! Absolutely love this color combination. It definitely is fun to play around with colors - and you aced it! Take care! This outfit looks amazing! I really want your sweater and your shoes! Bonnie, I'm so happy for you! Btw, I think I have fallen in love with your shoes. Thank you for your sweet comment on our site! We really love your blog. 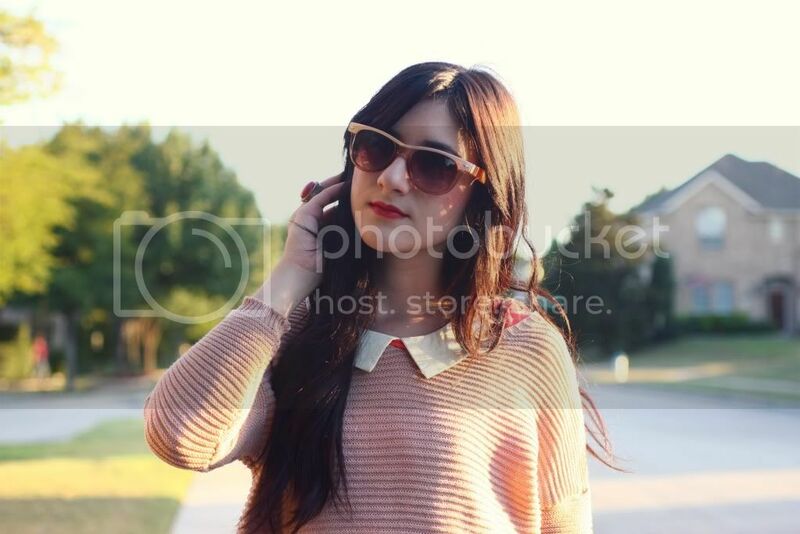 You have it all here, gorgeous photos, an amazing sense of style, and you area pretty girl. We are following you now and would love for you to follow us if you are interested. I love your shoes. How can you walk in them all day? the heel is huge! I think it looks so lovely on you!